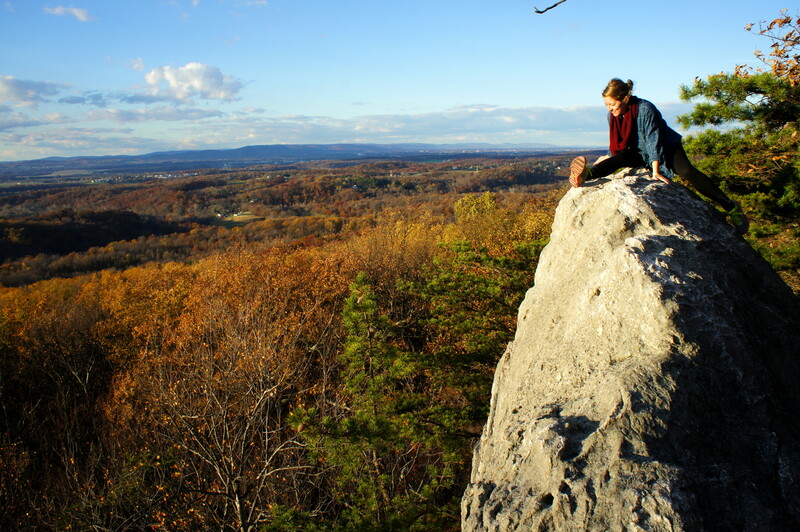 Maryland’s Sugarloaf Mountain, the area’s best known example of a monadnock, features a network of zigzagging trails, just an hour’s drive from Washington, DC. 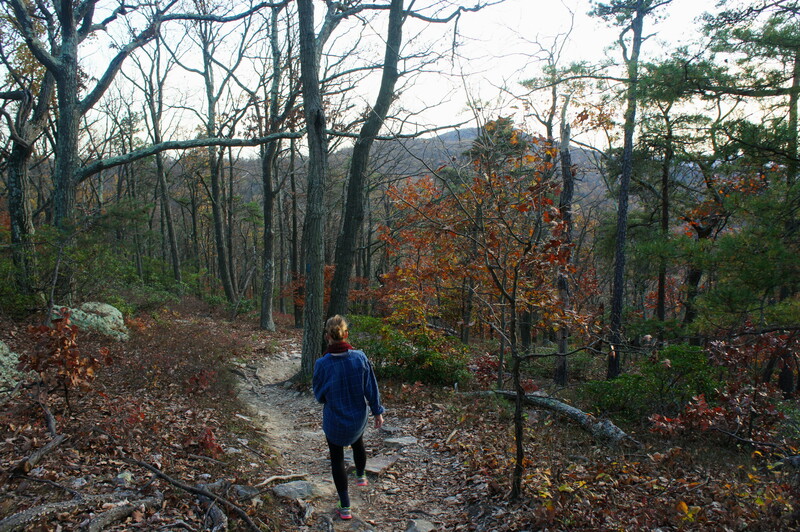 While climbing Sugarloaf itself is the park’s key attraction, the Blue Trail (a.k.a. 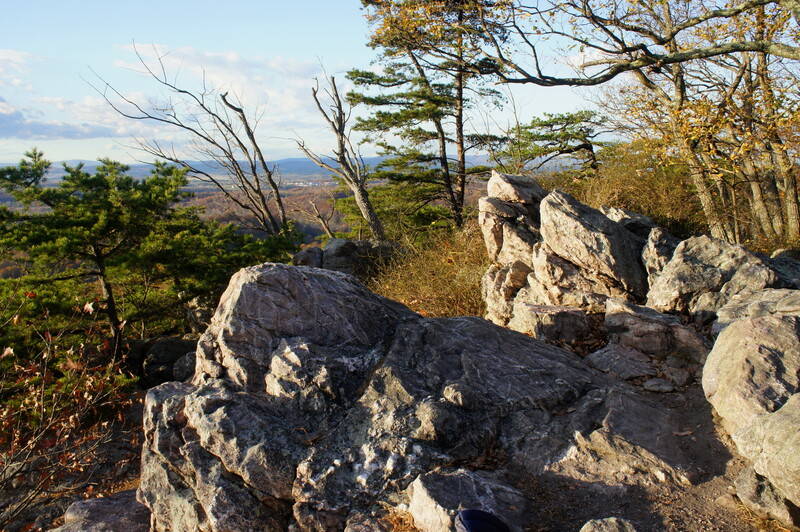 Northern Peaks Trail) triples the fun with rocky climbs to three nearby summits, plus a short detour to White Rocks, a fantastic set of viewpoints overlooking Frederick Valley to the west. 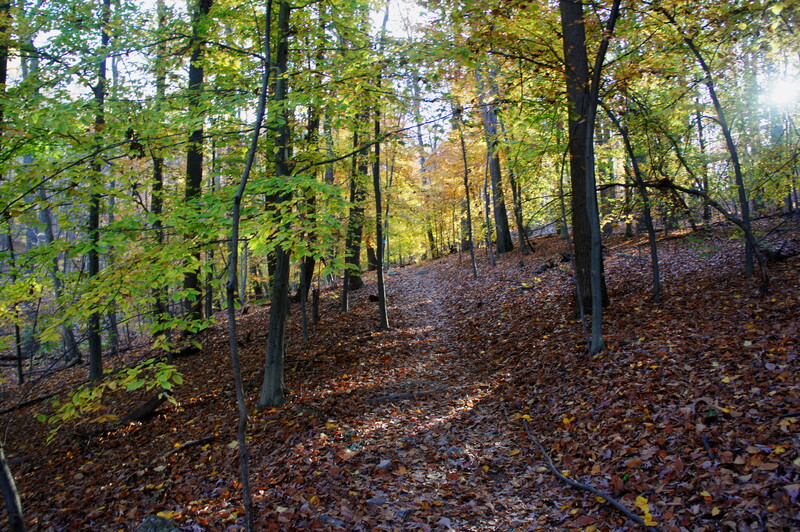 Clocking in at about 5.5 miles, this loop hike provides a fine introduction to the park at Sugarloaf, protected and managed by the trustees of Stronghold Incorporated since 1946. Heading sharply downhill, the stony path skirts the edge of a quartzite escarpment before reaching the first of many trail junctions, roughly 100 yards from the start. 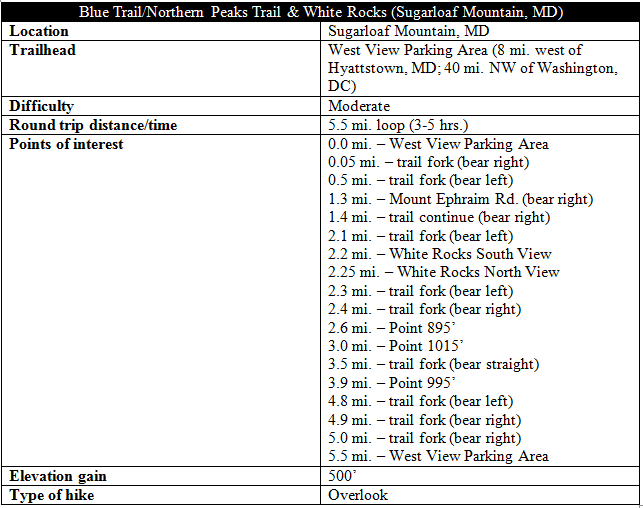 Bear right, now following the white-and-blue blazed path as it continues westward and flattens out, with some obscured views out over Frederick Valley through the trees. The trail takes a hard right at around 1/10 mile, now bearing north amid dense deciduous forest. Towering oaks abound, as well as poplars, hemlocks, sycamores, and pines, and mountain laurel appears in scattered bunches. 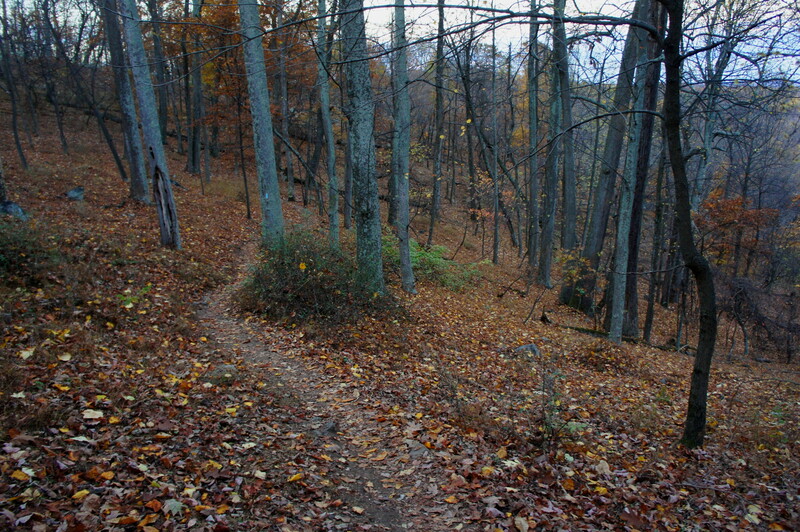 The next leg begins with a sharp uphill, cresting a woody knoll. Gradually scaling a 350-foot ridgeline, the path levels off briefly as hikers approach the 2-mile mark and then drops again for a brief downhill section, only to climb again to another trail junction. This four-way fork offers access to White Rocks, a sun-soaked terrace of stony cliffs, split into a north and a south view. Heading to the South View first on a trail spur, bear left at the junction, reaching the overlook in a minute’s time. Unfolding to the west is Frederick Valley, which doubles as the floodplain for the Monocacy River. 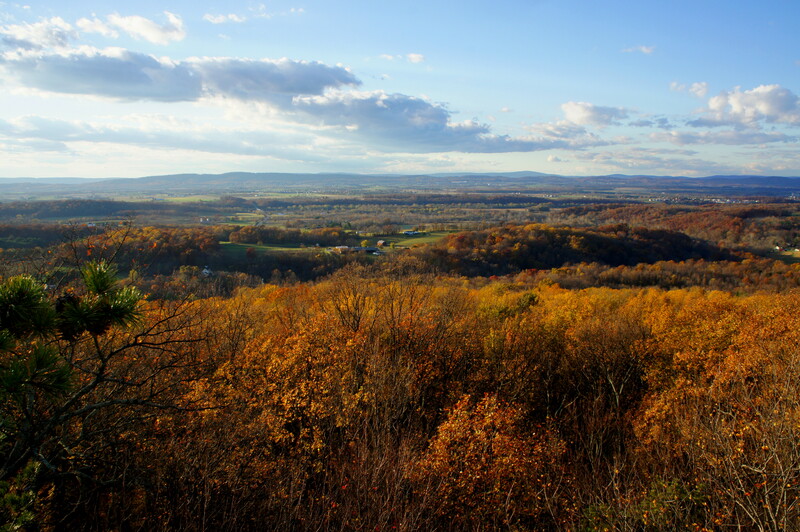 Beyond are the gentle southern fringes of Catoctin Mountain, followed on the horizon by South Mountain farther west. 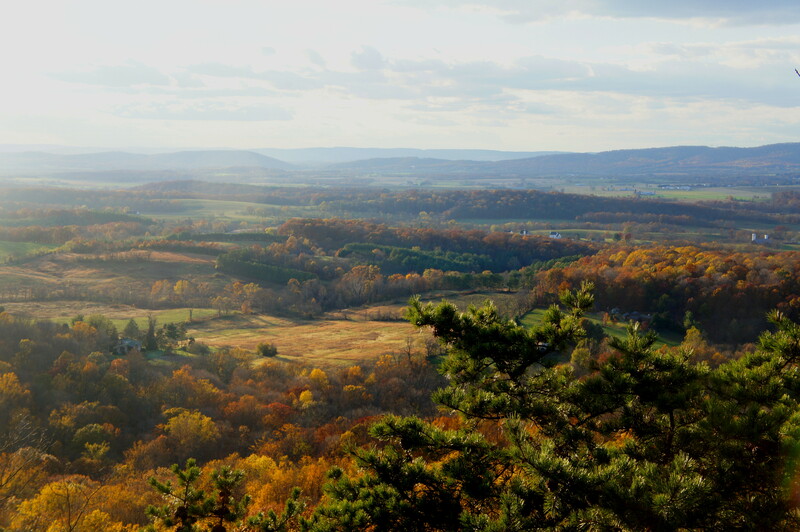 To the south, rolling hills and fields extend to the Potomac River (not visible) and Virginia beyond. The array of rocky perches at the viewpoint lend themselves to taking a break and staying awhile, especially in early evening as the setting sun casts misty shadows on the valley. From the South View, there is a social trail heading left that offers a shortcut to the North View, equally as appealing, though there is not as much room to (safely) sit for a break. From here, you can see up the valley toward Frederick, Maryland, a city of 67,000. Follow the official path heading south from the North View, and reconnect with the main trail at 2.3 miles. From here, the meandering trail crests the first of three lesser peaks (Point 895’) on the route back to Sugarloaf Mountain and the parking area. (Note: There is little fanfare at the summit, however, as it is shrouded with trees.) After briefly descending, the trail climbs to a second high point at 1,015 feet, this peak marked with a large pile of hefty stones. Point 1,015’ also marks the northernmost reaches of the hike, and the Blue Trail thereafter heads south as it drops sharply, down occasional switchbacks, to a low pass. At 3.5 miles, the track splits four ways; stay straight on the blue-blazed path. Climbing again, the trail climbs to a third, very rocky summit (Point 995’) at 3.9 miles. From here, the Northern Peaks Trail descends again, then crests a rock-strewn ridgeline and hugs the east flank of the Sugarloaf Mountain massif. 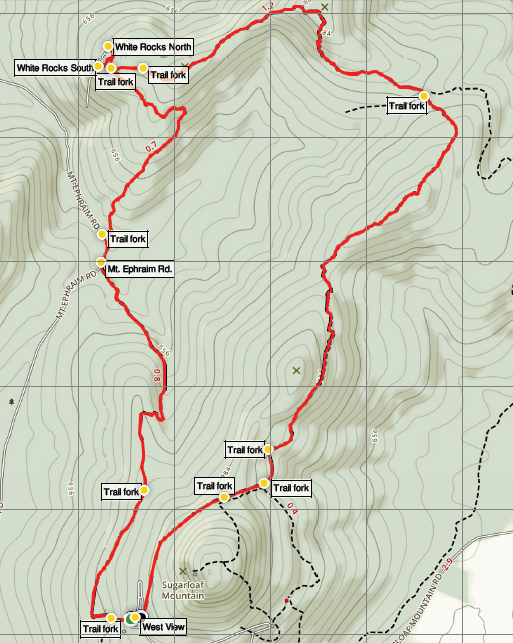 At 4.4 miles, the path crosses an unmarked trail/road, then, minutes later, hikers reach another junction. Head right, again rejoining the White Trail for a brief moment, before the Blue Trail veers off to the right at a subsequent junction 1/10 mile later. Returning to west-facing slopes, the trail approaches the McCormack Overlook at mile 5, where a rock outcrop on the right offers obscured vistas. Stay straight as the Red (Monadnock) Trail heads for Sugarloaf’s summit on the left. The home stretch is relatively flat and flanked with mountain laurel on both sides. At 5.4 miles, a spur trail offers access to the West View parking area on the right, while the main path presses on, emerging minutes later at the shelter, trail kiosk, and traffic roundabout mentioned at the start. And so the Northern Peaks Trail is complete. All in all, this 5.5-mile loop, including the two spurs to White Rocks, takes at least three hours; casual hikers will want to allot at least 4-5. 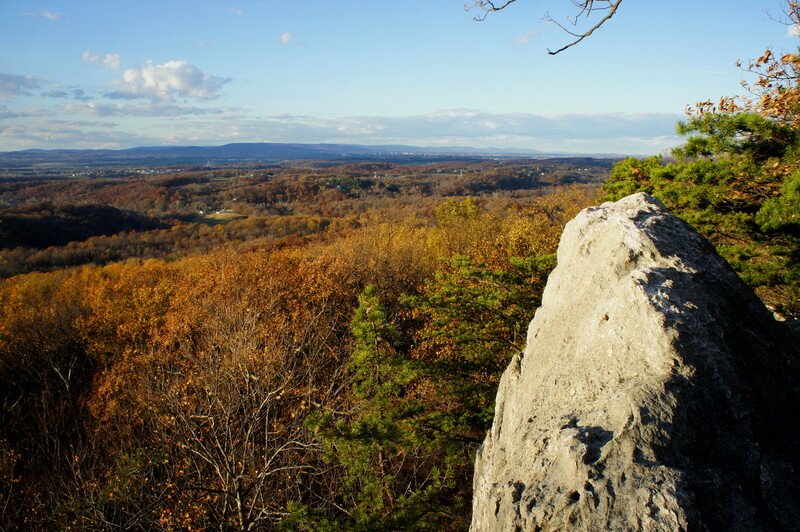 This entry was posted in Maryland, Moderate Hikes, Sugarloaf Mountain and tagged Bear Branch Bennett Creek, Blue Trail, Frederick Valley, loop hike, Maryland, Mount Ephraim Road, Northern Peaks Trail, Sugarloaf Mountain, West View, White Rocks. Bookmark the permalink.